I haven’t seen many photographs showing this striking view of Dallas along Houston Street. This is what visitors saw when they emerged from Union Station after having arrived in the city by train: in the distance, the John Deere Plow Co. Building on Elm, the Dallas Jail and Criminal Courts Building, the Dallas County Courthouse, the Texan Hotel, the Jefferson Hotel, and (mostly out of frame at the right) the very pretty Ferris Plaza. 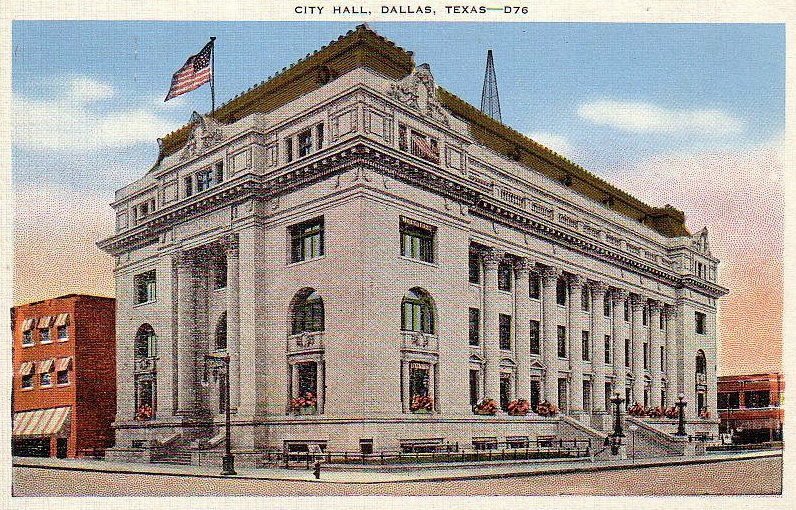 This photo was taken as one of several coinciding with the formal opening of the Jefferson Hotel’s major new addition (the addition is the taller, lighter-colored half of the hotel) — it was published in the May 8, 1921 edition of The Dallas Morning News in a special Jefferson Hotel section of the paper. I guessed that the the date of the photo was later because of what looks like a radio broadcast tower on the roof. Commercial radio broadcasts were not available in Dallas until June of 1922 when WFAA went on the air (their rooftop towers looked like this). WRR — the municipal broadcasting station — was a little older, but in those early days it was used exclusively for police communication (they appear to have had an aerial on top of the City Hall by at least September of 1921, if not earlier). So what was that tower on the roof? It took a while to find out what it was, but … turns out it was, in fact, an antenna. It was part of the “wireless telegraph” equipment owned by the Continental Radio Telegraph Co., which had a Western Union-like office in the hotel’s lobby (the company had to relocate their tower and office from the Southland Hotel, their home for a little over a year before moving to the Jefferson’s roof). The Continental Radio Telegraph and Telephone Co. began in about 1919. It was one of the first companies in the Southwest to attempt to commercialize the nascent “wireless” technology which allowed the sending and receiving of messages via radio waves. The initial motivation for establishing this new-fangled business appears to have been the inability of those with interests in the remote Texas oilfields to communicate with their workers in areas not served by telephone and telegraph wires. The plan was to build radio towers in these areas to broadcast and receive messages. 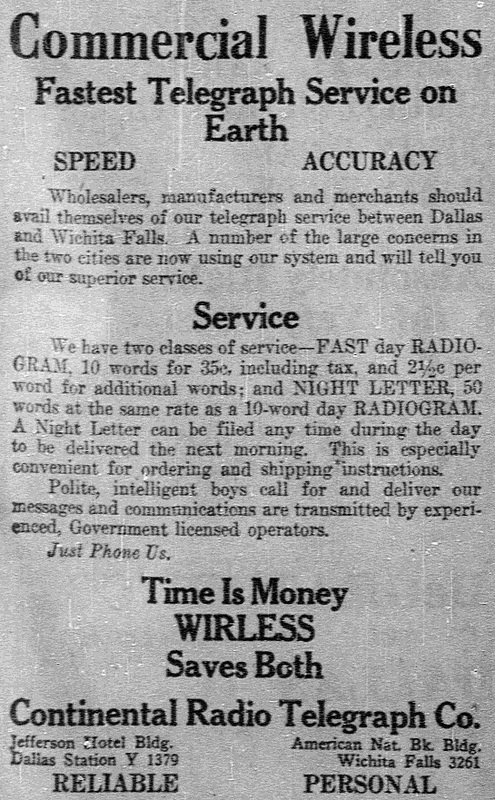 When a “radiogram” was received and transcribed, a “polite, intelligent boy” would be dispatched to deliver the message to its recipient — all for about the same price as sending a regular telegram. Not only did the company envision the ability to one day communicate with ships, trains, and airplanes that were in transit, they also hoped to develop “wireless telephone” communication. 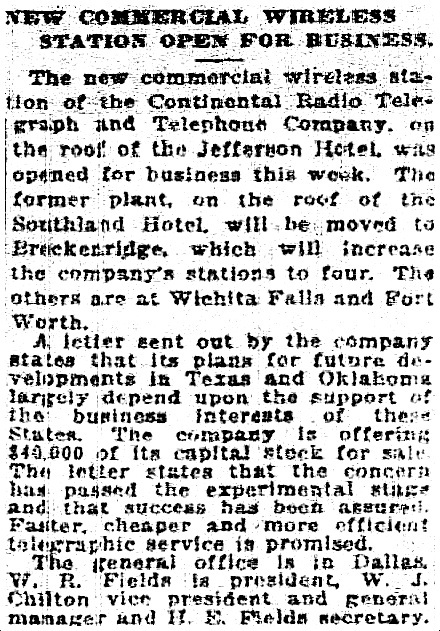 The Continental Radio Telegraph Company was based in Dallas from at least January of 1920, but they were gone by the time the 1922 city directory was printed — gone just a few short months after planting that aerial on top of the Jefferson Hotel. They seem to have erected only four towers: in Dallas, Fort Worth, Wichita Falls, and (possibly) Breckenridge. Then, as now, technology has a way of racing ahead of somewhat limited business plans. But at least we have a nice photograph of their rooftop tower as proof that they existed. Here’s a shot from the same location a few years later; the tower has been replaced by the huge Dr Pepper sign which became something of a city landmark, and the Hotel Lawrence has popped up and is open for business next door. Photo with the Dr Pepper sign was purchased at an antique mall/flea market and was uploaded to Tumblr, here. 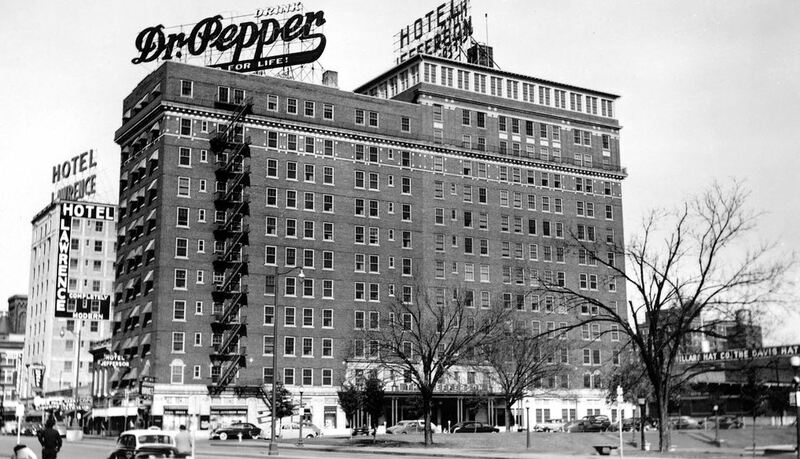 The tower didn’t last long up on the roof, but that space hosted a gigantic Dr Pepper sign for many years (see here). 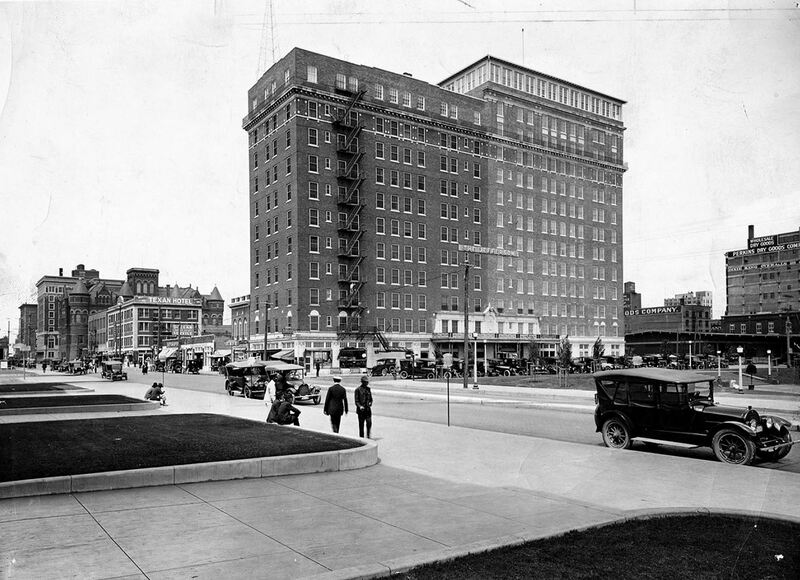 The Jefferson Hotel — which opened in October, 1917 — was demolished in 1975.